My last two Food Shows were pretty special: Meeting “Bake-Off Beauties” from previous seasons who were in attendance, marketing their respective Cookery Books for Christmas. Both were friendly, chatty and really charming people. Other Food Shows on my blog include: Europe’s largest Allergy & Free From Show in London and it’s sister show in Liverpool, as well as BBC Good Food and the Salon Du Chocolat, and even the Speciality & Fine Food Show, Food Matters LIVE. Overseas Shows include the Gluten Free Food Allergy Fest in Stamford, CT, USA. The Foodie Festival is a real contrast to my “usual” Food Fair with lots of artisan providers, many GLUTEN FREE. This was a less corporate affair and whilst there were “big Brands” in attendance it wasn’t dominated by larger supermarkets or the large GF brands with huge stands but was more little tables with very individualized displays and products. It is also more intimate and therefore, a great opportunity to chat more personally with the owners /business entrepreneurs, rather than marketing /PR people. It is held at the Old Truman Brewery, located in the East End of London, so a little bit of a trek for me, but an opportunity to wander down Brick Lane and see the gritty side of London Town. The festival is held in several rooms across two floors of this old brewery with cooking demonstrations, bands /singers and lots of stalls. After attending NYC first GF Oktoberfest, I now notice and always try the Ciders on offer, and good to see Bulmers Blood Orange Cider was for tasting. This has a sharp refreshing taste and is GLUTEN FREE. Next to them, Strongbow were also tasting their Cloudy Apple Cider and this was fine: nothing special but never turn a drink down! Also caught the end of Charlotte White decorating a beautiful cake, although it was NOT GLUTEN FREE and I dont really know who she is, it proved very popular, with a huge crowd rushing forwards to try her decorated cake! After a wander, I returned to the Cake & Bake Theatre to see Richard Burr, Finalist from 2014, the “builder” with a pencil behind his ear (which he still has) and watched him make a beautiful Swedish Wreath which looked amazingly simple: although he didn’t make it live (as the dough needs resting and time to rise, which doesn’t really work when you’ve got an audience watching you and wanting you to cook). He was very honest and answered lots of odd questions around Bake Off as well as providing hints and tips for his recipes. A real charmer and one that I had a chat with about GF baking. With his Swedish Wreath, he suggested that you could replace the flour with a GLUTEN FREE Flour blend, although it wouldn’t rise as much: so maybe I’ll try it! He also encouraged me (or someone who is a Coeliac) to enter the competition as he outlined it’s filming starts in April and they’d love a genuine allergy-baker! Also at the Foodie Festival was award winning Marmalade which is made by Love Jam Kitchen. I didn’t know that Jam came in so many varieties and many from British fruit! Great to meet the founder and entrepreneur of Free From Bakehouse, a brand who I have seen in Wholefoods and F&M. They had a huge array of beautiful cakes (ALL GLUTEN FREE) and looking amazing. I learnt that after a career change, she saw a market niche, which she has now filled and provides for, and it was inspirational to hear her story. And always good to find new GLUTEN FREE products on show: and I found the Snaffling Pig: flavoured pork scratchings! Now, not all of the flavours are GLUTEN FREE but several of them are, and they tasted really good: of course crunchy and salty but with a subtle hit of flavour. I tried the Salt & Vinegar (GLUTEN FREE) as well Habanero (which was a little spicy for me) but these are freshly made with new flavours to be launched next year! And finally for 2015, I went along to the South London Coeliac Support Group‘s Christmas Food Fair. I spotted this on Facebook, (as a member of the West London Coeliac Support Group) and was keen to head South of the River to SW18 and see the “local” food fair, especially so close to Christmas! It was held at the St Barnabas Church Hall and was literally a handful of producers in one room. A good mix of large brands (Juvela and Barkat) as well as specialist producers. Borough 22 make amazing GLUTEN FREE Doughnuts: available in Selfridges, London and at the GF Fair in SW18. I think you eat with your eyes and these are beautiful. Made in London’s 22nd Borough, these were the Nutella doughnuts and I can confirm they are GLUTEN FREE and EGG FREE. And my highlight was meeting and chatting with Howard Middleton, Bake Off King from 2013, whom I have seen deliver a very entertaining cooking demonstration last year. He gave a GLUTEN FREE cooking demonstration and his new book focuses upon “Delicious Gluten Free Baking” which I bought and he signed for me, with a personal dedication. He is also a charming man whom has several friends with allergies, hence his interest and experience with GF baking. He was also another one who encouraged me to enter the Great British Bake Off but not sure you’ll see me anytime soon! If you are a member of Coeliac UK, they produce a comprehensive directory which covers over 16,000 food and drink items (including GLUTEN FREE Chocolate Bars). And at Christmas, they produce a highlights sheet which outlines key products. This is available in a paper-based Manual and online FREE to members of Coeliac UK. One of the hard-hitting posters (featuring Yours Truly) from Coeliac UK launched for Awareness Week, held earlier in 2015 and to be seen in 2016. SIGN UP so you do not miss out on future updates to the Chocolate Bar listing, as well as new Restaurant Reviews, Product Reviews and (occasional) Recipes. Also check out my posts on GLUTEN FREE Ice Cream, GLUTEN FREE Advent Calendars, GLUTEN FREE Mince Pies, GLUTEN FREE Easter Eggs and GLUTEN FREE Valentines Treats. 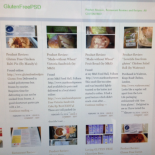 This entry was posted on December 23, 2015 by glutenfreepsd in Gluten Free @Food Fairs, News & Views, Product Review: and tagged Bake Off, Borough 22, Coeliac UK, Foodie Festival, gluten free bread, Gluten Free Cider, Gluten Free Doughnuts, Howard Middleton, Richard Burr, South London Coeliac Group.